By some key benchmarks, this is a good time to borrow money. Interest rates are staying relatively low and more consumer protections are in place to help borrowers avoid becoming victims of bad baking practices. But in spite of – and in part because of – those conditions, loans are harder to get. And that means more and more borrowers who can’t meet lenders’ new standards are turning to the Bank of Mom and Dad – or a close friend. As wary lenders struggle to recover from the aftermath of the great housing collapse of 2008, new regulations continue to tighten standards for qualifying for loans. Mandates covering mortgage-lending standards, such as the Qualified Mortgage Rule, impose stricter qualifications on buyers, and individual lenders may have even more stringent requirements. Add to that down payments and other closing costs, and borrowers with iffy credit and relatively little money become locked out of the process. That’s why first time borrowers are increasingly turning to family members for startup cash to buy investment properties of the kind Jason Hartman recommends. And that can benefit both sides, as long as the process stays businesslike. Covered by the general term of “private home loan,” financing from loved ones generally works very much like the lending process used by banks – and it should, say personal finance experts. Lenders and borrowers need to draw up a contract that lays out all aspects of the transaction – term of the loan, interest rates, penalties for default and so on. The contract is binding, and enforceable by law – including foreclosure if the loan isn’t paid off. Financial consultants emphasize that a private loan may be personal, but that doesn’t mean that it isn’t all business – and that’s often where private lending goes awry. The loan can’t be used as leverage for personal issues that aren’t related to the transaction. It’s important to consider: would a bank or other lending institution behave this way? If the answer is no, then neither should the private lender. Even with those stipulations, a private loan can make things easier. Interest rates can be lower, since both parties agree on the terms. Payment schedules and other features of the loan can be negotiated too, offering greater flexibility in managing the loan over time. Plus, mortgage interest is tax deductible for this kind of loan as well as bank loans. 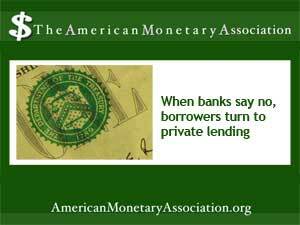 Private lenders benefit, too. They may be able to negotiate a higher interest rate than they might get from other investments. And the payments made on the loan come back to them in a steady income stream for the term of the loan. Private loans can be negotiated with or without the help of an attorney or other financial adviser. If you opt to go it alone, though, it’s essential to include the key elements of any binding lending agreement. A promissory note is a legally binding document that states that the borrower promises to repay the lender according to the terms agreed upon by both parties. A mortgage document or “deed of trust” secures the promissory note and gives the lender the authority to foreclose on the property. And although a written repayment schedule is not legally required, it still establishes clear terms and keeps things businesslike.